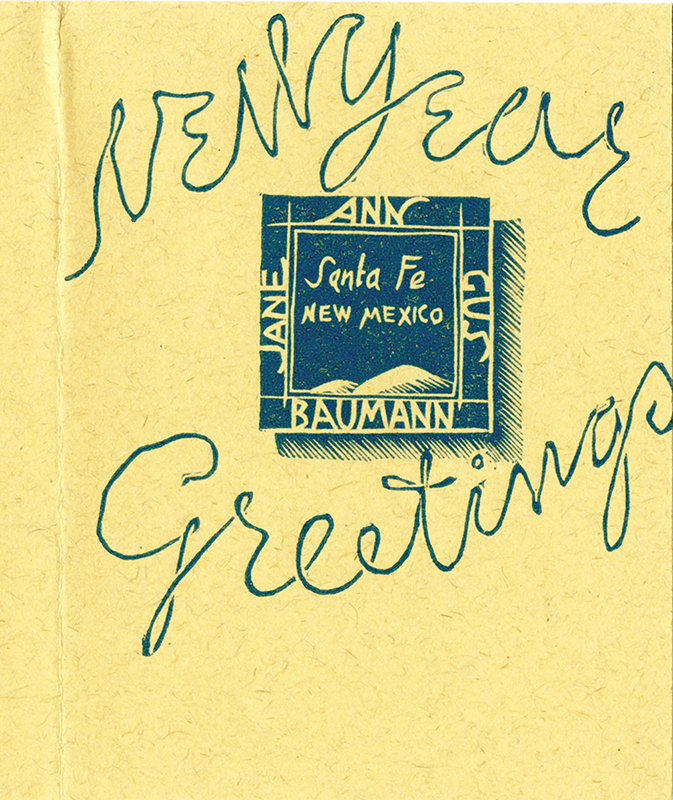 The New Mexico History Museum in Santa Fe is featuring an exhibition entitled Gustave Baumann and Friends Artist Cards from Holidays Past curated by Jean Moss and Thomas Leech who also co-authored a book of the same title, which has been published by Museum of New Mexico Press. Moss and Leech did a remarkable job of designing both the exhibition and book. If you plan on visiting Santa Fe before the end of March, we highly recommend that you visit this small but wonderful show. Baumann’s first known Christmas card dates to 1905 but it wasn’t until 1913 when he was established in his studio in Brown County, Indiana, that he produced another. 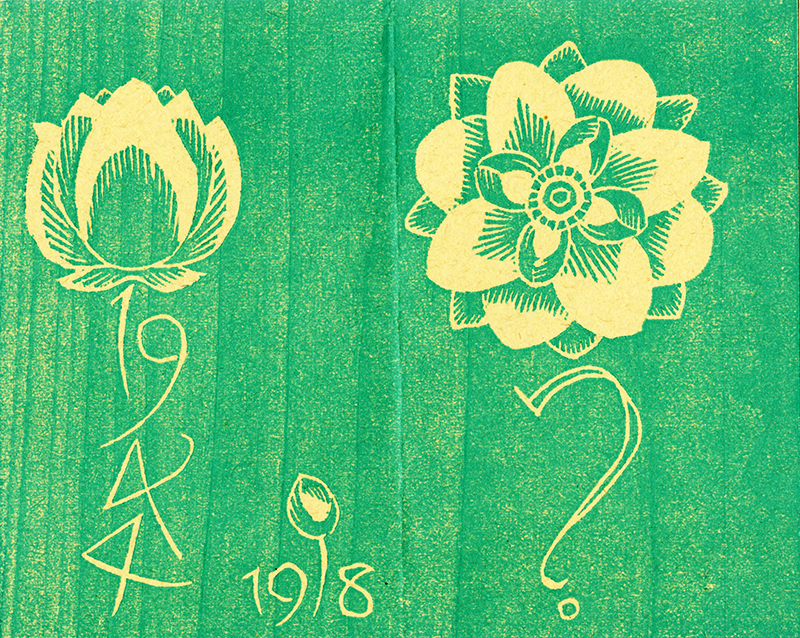 Cards followed over the years and most were carved and printed by Baumann. When his schedule was tight he would arrange for Willard Clark, fellow Santa Fe printmaker, to letterpress print his cards. The early cards reflect the regions that they were produced in. The cards from Baumann’s Brown County days illustrate the people and landscape around Nashville, Indiana. After he moved to the Southwest, Native Americans, Hispanics, rodeos, ceremonial dances, and the flavor (ristras of chile) of Santa Fe, influenced Baumann’s designs for his cards. 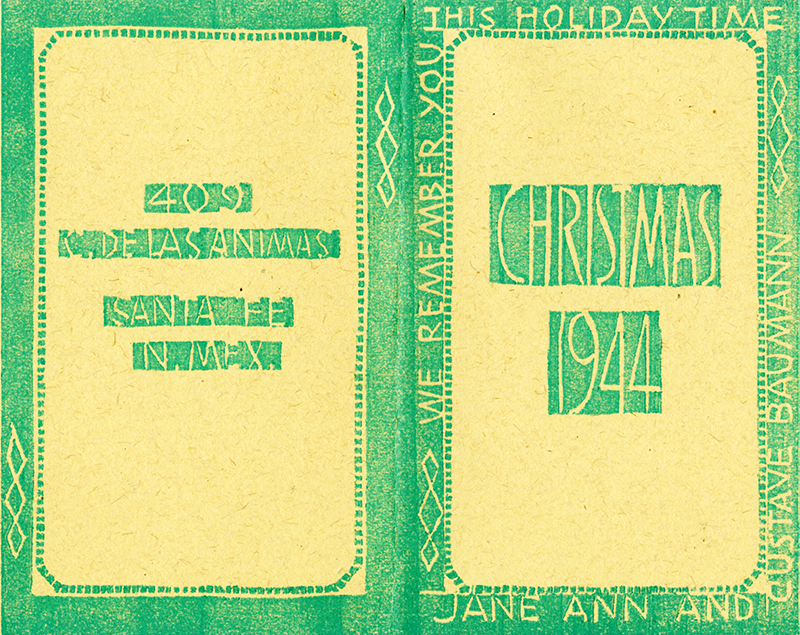 In the mid 1920s, Baumann’s cards focused on domesticity. The card for 1925 featured the German inspired dining room in his home. His card for 1927 was a geographical treatise showing his residential lot with the newly built studio behind the house. 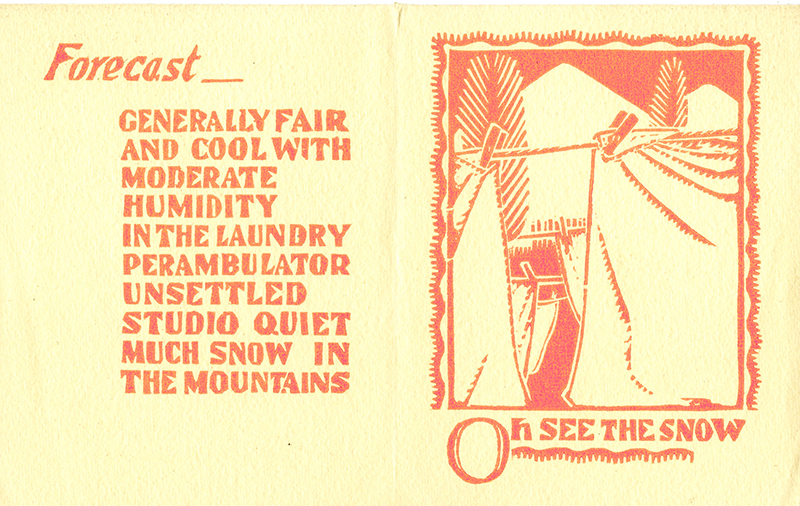 His daughter, Ann, was born in 1927 and his 1928 Christmas card illustrating diapers on the clothesline provided this weather forecast for Santa Fe and vicinity: Generally fair and cool with moderate humidity in the laundry/perambulator unsettled/ studio quiet/ much snow in the mountains. So much time and creativity was invested in each card and it would have been a treat to be on the receiving end. 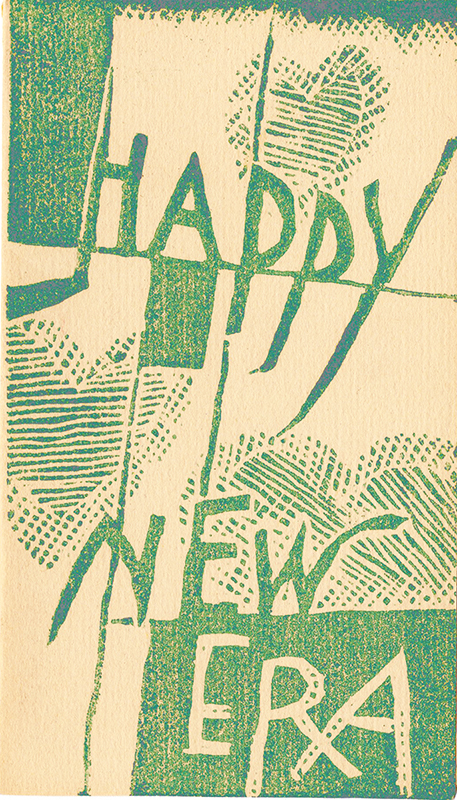 The gallery has a few of Baumann’s holiday cards posted on our website and they can be viewed along with his color woodcuts if you click on this link: Gustave Baumann. 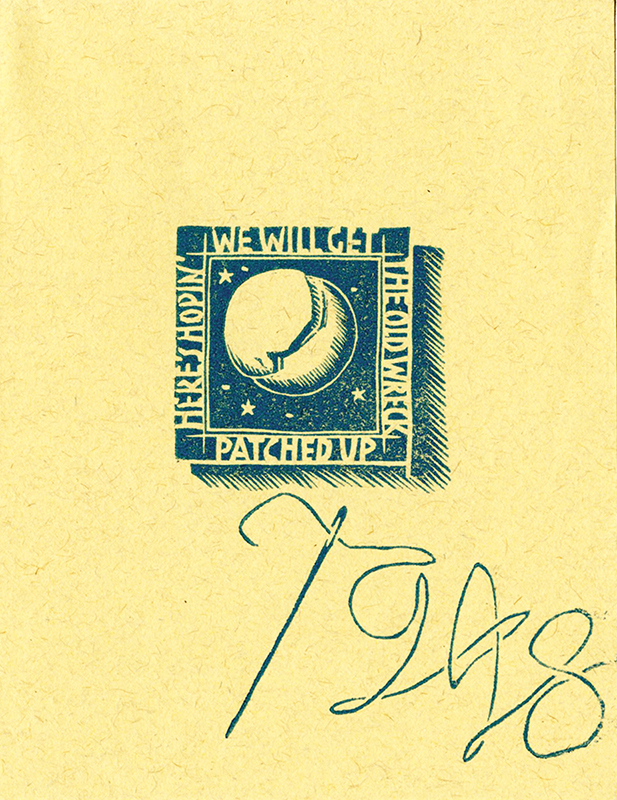 The Annex Galleries holds one of the largest original fine print inventories on the West Coast. With over 9,000 works, we specialize in (but are not limited to) original prints of the WPA era, Arts & Crafts movement, and Abstract Expressionism through the 1960's, with a focus on American and Californian artists both known and unknown. We have everything from Durer to Baumann to Picasso.